01: Homecoming - Uther's daughter Morgana returns from banishment and poisons her father. Merlin arrives too late to save the king but gets Uther to acknowledge his illegitimate son on his deathbed. Merlin takes the boy to the ruined citadel of Camelot. 02: The Sword and the Crown - Morgana has trouble in her alliance with King Lot. Arthur acquires the sword in the stone and is crowned King. 03: Guinevere - Morgan invites Arthur to a feast and Merlin accompanies him. 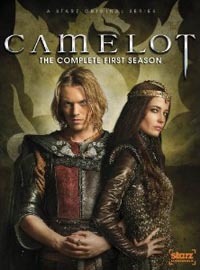 While the temptress delays Merlin, Arthur returns to Camelot drawn by his fascination with Guinevere. Meanwhile Kay and Leontes seek out a famed warrior to recruit him to Arthur's cause.